Creating and organizing an inventory system was quite a challenge as well as an achievement. The magnitude of paintings, works on paper, graphic and photographic prints, documents, and publications that had to be organized and catalogued was enormous. It was indeed an overwhelming task I could have never accomplished alone. It was something I’ve been meaning to do for years, especially after a fire at home where suddenly my archives were turned in total disarray and lost. The Joan Mitchell Foundation CALL Program made it possible for me to begin looking through my work and establish a specifically designed and functional artist data system in a structured and organized manner. The CALL assistants Andres Laracuente, Brian Hogan, Chris Hagerty and Alison Owen came in at various stages of this process and they were all terrific. They have the training, attention, understanding, consideration and experience to help pull me through all this. With the launching of this inventory system, I can acquire data on particular works of art and easily forward it to interested parties. There are still much to do because this is an on-going process but I can begin to seriously entertain the establishment of an estate for my family. I thought we should begin with what was expected to be the easiest and less time to do which to start with prints and works on paper. As it turned out, it took much longer then what we expected and to this day, there is still much to do. Yet it was great that we started there because we did cover much ground which will make completion much easier. Design and building storage of oversize prints was a challenge but was accomplished. Next we had to deal with the large, single and multiple paneled paintings which was endless and yet we succeeded do all but two or three paintings I am still working. Paintings were further documented and properly packaged for storage. We also began thorough listing of exhibition catalogues, art and art history books among other publications that contain essays, writings, interviews and images about my art. Much has been completed in that area but more publications keep surfacing and we still need to include articles, essays, interviews and art reviews published in numerous newspapers, periodicals and brochures. I would also like to scan and add printed announcements from numerous solo and group exhibitions I’ve collected throughout my career. Cross referencing every data throughout the system has to be further developed but what has already been accomplished, I can further give shape and build on an infinite data system. It is gratifying to see some assemblage of my years as an active artist and cultural worker. In retrospect, I can now evaluate my work and career with certain perspective. I am able to look at my history as an artist with certainty, perspective and a wonderful sense of accomplishment. The CALL program has impacted and further defined my own sense of consequence and worth. It gave me a clearer awareness of how much my work has evolved. It is a data system which has constructed for me further awareness about my art. It has accumulated a chronology of my role and place in art, culture and history. It also points to the various paths I have taken and other possible directions my art can move towards. The CALL program has opened up a new outlook for me and for my art. What has been difficult for me is the thought of going through such immensity. The labor of pulling out, unwrapping, moving and dusting and repairing of artwork you have not seen for more than two decades was exigent. Remembering was also difficult and at times perplexing. Seeing work you have not seen for many years’ stimulated much reminiscences but not often the most critically important of details. I often depended on outdated index cards, other old documents and perhaps some videos to get a clearer sense of the work at hand. That in itself is laborious. Most difficult for me was seeing a number of pieces that has been severely damaged through the benign neglect of time. There’s the anxiety of figuring out possibilities for repair or sadly coming to terms with damaged works bordering to being destroyed. Begin to keep records, file of all kinds of documents regarding listings of every solo, group exhibitions, lectures and panel discussions, announcements, interviews, articles and essays about your art, catalogues, publication, web links, blogs and, most important, digital and printed images of all artwork permanent and ephemeral, installations, performances, etc., you have ever created. To begin organizing such materials requires great patience especially when it comes to every piece of information and details. To create and organize an inventory system is one thing but maintaining and expanding it for the rest of your creative life is another thing. It is definitely most challenging because it demands constant attention and deciline. To take extra measures in the care, protection and storage of your art can be most challenging. On Wednesday, November 18, 2015, CALL artist Juan Sánchez was interviewed by VoCA Program Committee member and Associate Conservator at Modern Art Conservation Jennifer Hickey. 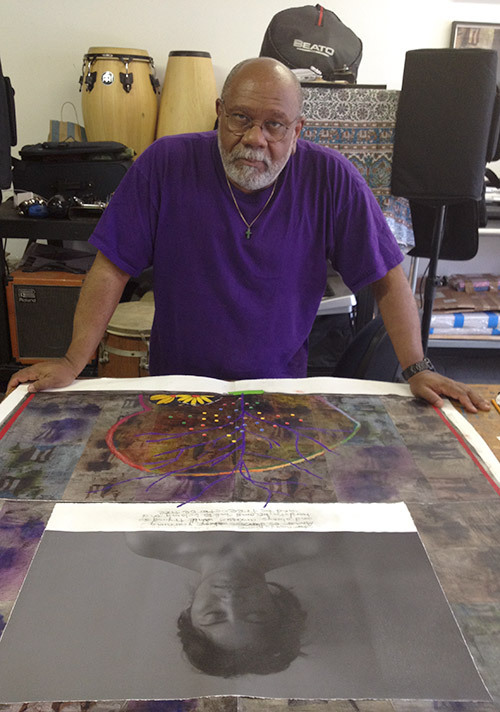 The conversation covered the artist's many sources of inspiration, past and current work, as well as his life-long commitment to activism. This event was one of a series hosted in partnership with VoCA, highlighting the CALL initiative while also underscoring the crucial need for dialogue with artists around the production, presentation, and preservation of their work. The full length Talk is below, along with a gallery walkthrough of Sánchez' exhibition at BRIC Media Arts House. A transcript of the interview is available upon request. Neda, 2011, oil, mixed media collage on wood panel, 74 x 72 inches. Angel de Vieques, 2006, oil, mixed media collage on wood panel, 74 x 72 inches. Para Martin Luther King, 2008, oil, mixed media collage on wood panel, 74 x 72 inches.